In this piece from Mountaineer magazine, we explore the unique geological structure of the Pacific Northwest. On February 28, 2001, a friend was being prepped for varicose vein surgery at the Seattle VA Hospital. He was given a mild sedative and began experiencing what he thought was vertigo when his surgeon announced that the procedure was cancelled and he needed to get dressed and leave the hospital immediately. An earthquake later known as the Nisqually, of a magnitude 6.8-7.0 had struck. My friend was disappointed at the postponement of his operation at the time, but it could have been worse. We know now that the Cascadia subduction zone extending from northern California to Vancouver Island has had earthquakes of the magnitude of 9.0, roughly 900 times the force of the Nisqually on a fairly regular basis, averaging about 500 years apart, with some occurring within 240 years of another. Forty –five years ago, this was unimaginable. There was no evidence of the kind of displacement or prior destruction that was so apparent around the San Andreas Fault in California. Then enter Brian Atwater of the U.S. Geological Survey. Brian locates a forest of very old dead trees, a “ghost forest” on the Copalis River in Pacific County, Washington. Salt water killed them, but Brian speculated that rather than being a gradual flooding, the forest was suddenly plunged into ocean waters by a precipitous plummeting of land mass that was lowered by an earthquake. Tree ring cores indicated that the entire forest had died simultaneously, supporting his thesis. Native American oral traditions had once described a tsunami decimating coastal villages hundreds of years ago. Amazingly, historical Japanese records of tsunamis placed one that had been of unknown origin at precisely the demise of the ghost forest that dendrochronology pointed to. The date was January 26, 1700 and Brian was confidently able to report that the heretofore “orphan” tsunami was likely generated by a 9.0 earthquake on the Washington coast. Another geologist, Chris Goldfinger from Oregon State University has since taken core samples of the ocean floor from submarine canyons that feed into the ocean trench of the Juan deFuca plate. His study of the sediment, called turbidites, that is washed off the North American continental plate edge after tsunamis confirms their frequency and magnitude. There has been more than one 9.0 quake in the Cascadia subduction zone. Perhaps lucky for us but unfortunate for others, the highest frequency seems to occur in the part of the zone from southern Oregon to northern California. What could this really mean? What are the odds? Are we truly “overdue” and by how much? Is this going to affect real estate values? Should our friends in Ballard consider selling and relocating to the Sammamish Plateau, and will it make a difference? How much does earthquake insurance cost and will I still be able to afford to dine out regularly at my favorite Indian restaurant? Why did I move here from New Jersey?! Nick Zentner, the popular lecturer from Central Washington University and recipient of “Most Inspirational Faculty Award” might have something to say. 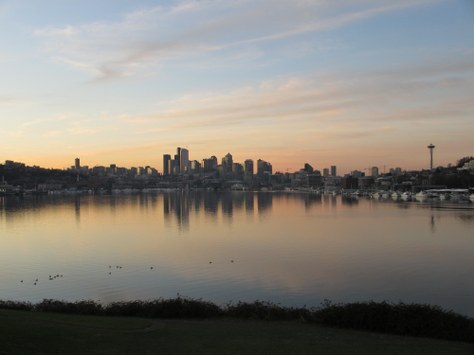 For one thing, Seattle is probably immune from the effects of a tsunami. The same cannot be said of communities in California, Oregon and Washington that are located within three miles of the coast. It might be less reassuring for us in Seattle to know that, in addition to the subduction zone earthquake potential offshore, there are also shallow crustal faults and one is directly underneath downtown. They are caused by the clockwise rotation of our slice of the North American plate. With all the data and debates and new information, this much can be said for certain: it never hurts to be prepared. For more information about the natural world, check out our Naturalist Speaker Series.